The computerized bernette 25 is the flagship model of the bernette series. It offers everything creative sewers need, all at an excellent price/performance ratio. The bernette 25 features an extensive set of 155 stitch patterns. Decorative possibilities abound with 25 decorative stitches (including an alphabet with numbers), all with a variable stitch width up to 7mm. The memory function lets you save up to 30 stitch settings and combinations. Eight presser-feet are included for most uses. 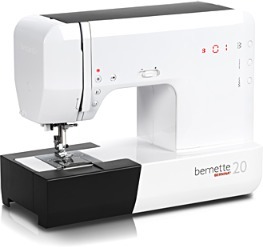 A computerized model for discerning sewers, the bernette 20 includes 60 stitch patterns with a generous stitch width up to 7mm, for wonderful creative embellishments. A window allows you to check the amount of thread remaining on the bobbin at any time. The convenient start/stop function lets you control the stitching process without a foot control. The needle-stop up/down function enables you to specify the position of the needle when you stop sewing. Six presser feet are included with the bernette 20. 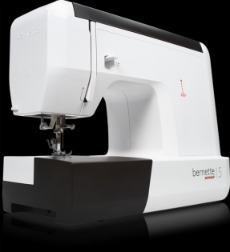 With its 28 stitch patterns and wide range of functions, the bernette 15 offers an extensive array of creative possibilities. The more advanced of our two mechanical models, the bernette 15 is ideally suited to beginners who need more features at an affordable price. The six decorative stitch patterns can be sewn at variable width up to 5mm. The needle threader and the automatic buttonhole function with length-measuring system make sewing easier. Six presser feet are included with the bernette 15. 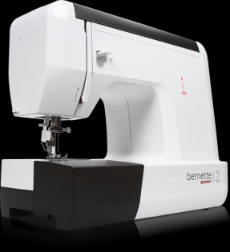 With 21 stitch patterns – 19 utility and two decorative – and a maximum stitch width of 5mm, the bernette 12 offers excellent basic functions at a very affordable price. The clear layout and user-friendliness of this machine make it the perfect choice for newcomers to sewing. It‘s simplicity itself to thread the needle with the built-in threader. The standard accessories include four presser feet. The cool retro look of the bernette 46 is reminiscent of early sewing machines. 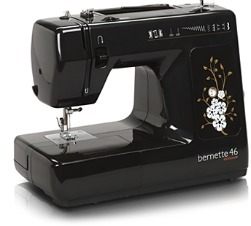 The bernette 46 is a great machine at an affordable price. With variable stitch width and an assortment of practical and decorative stitches, the bernette 46 helps you turn your sewing dreams into stitched projects!